Each week we come to hear from, the Bible, sing together with both traditional and more lively music and pray. We share Communion on the first and third Sundays in the month. Evening Service - 6.00pm (Revive@6) is less formal and a bit more lively! Refreshments are served after the morning service and all are encouraged to stay and chat. The service lasts for about an hour and is quite informal. It's open to everyone - you don't need to be a member or even believe in God to come to church and see for yourself. This is an opportunity for anyone who would like to pop into the church - perhaps just to spend a quiet time with God. 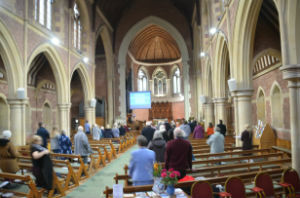 The church is open from 11.30 to 1.15pm and the service starts at 12 and is over by half-past. It is a simple time together, just a couple of readings, some thoughts on a Gospel passage and time to pray silently or out loud as you prefer. There's coffee available after the service and space to sit and chat, or just sit and be. You are very welcome to come in and join us - you don't need to be a member of the church to come.